Back in October, Alex and I moved into a new apartment. (We had spent only a year in our previous place. The apartment wasn’t bad but the landlord was greedy.) 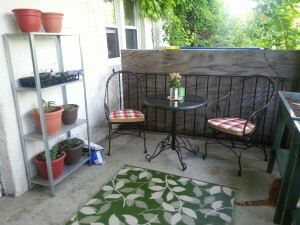 When apartment hunting, I specifically looked for one with outdoor space because I was hankering for some gardenin’. At a certain point, though, I’d given up on finding my dream place and started responding to ads without photos. (The shock! The horror!) As luck would have it, one of the apartments we went to see actually had a terrace! The apartment was also very attractive but the terrace was the clincher. I have two window boxes that are hanging over the railing that contain mint, parsley, and basil. (I had cilantro but it started bolting in the 70°F weather. Now I’m trying to see what happens when you plant store-bought scallions that have been kept in water…) I have several pots that contain tarragon, oregano, lemon thyme, and sage. 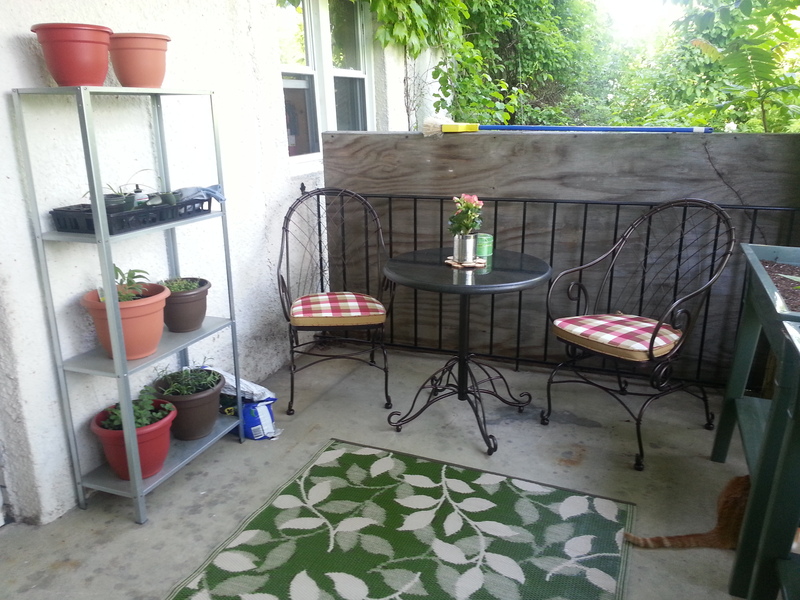 I also have three elevated planters that house multiple okra plants and a dozen green bean plants. The small begonia plant I picked up at Trader Joe’s this morning is so precious! Out front, I have another elevated planter that houses a handful of strawberry plants. (It’s so exciting seeing the berries form! Now to try to keep the squirrels and birds away from them…) There’s also room to plant more things but that may be a project for next year. I’m thinking a blueberry bush and a fig tree in a super sunny spot on the side of the house. For a girl who thought she had a black thumb, all of this gardening is very exciting! I started slow (planting just the two varieties of veggies) not only because I’m a first-time gardener but also because Alex and I just signed up for the local CSA. I was afraid of being inundated with kale, tomatoes, and zucchini all harvesting season long. I’m eager to see how everything turns out but, in the meantime, I’m enjoying a cold beer on my terrace, watching ships sail across the New York Harbor. Previous PostPrevious Did you do somethin’ new? Allie is a 32-year-old systems librarian in NYC. She’s into books, knitting, baking, cooking, biking, lifting weights, among other things. More?